Torn ear lobes are difficult to repair. A torn ear lobe usually occurs after the pierced hole widens over time from the weight of earrings or plugs. Once the ear lobe is weakened, continuing to wear heavy earrings can result in a tear. Other types of tears can also occur, such as earrings being accidentally pulled through the lobe. When your ear lobe is torn, it usually requires surgery to repair the wound. 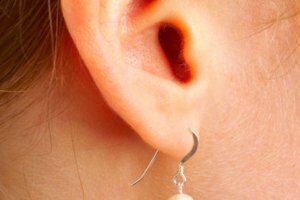 Here are a few tips to help you repair your ear lobe successfully. Make an appointment with a plastic surgeon who specializes in ear lobe repair. Your surgeon will be able to tell if your lobe requires surgery. If only the bottom is torn, surgery is delayed until after the lobe has healed. If the tear starts from a small pierced hole it can be immediately repaired. Have your ear lobe repaired. Repairing an ear lobe involves using local anesthesia and reopening the tear to sew the lobe back together. Typically, tissue is cut in a special pattern called a "Z-plasty" flap. Flaps are used to redistribute tissue and reshape the ear. You may need painkillers, but usually there is little or no pain after having your ear lobe repaired. If you do have any discomfort, use over-the-counter painkillers like ibuprofen to alleviate the pain. Make sure to clean your wound. Gently wash your repaired ear lobe with antibacterial soap and water 3 times each day, then pat dry. Dab a thin layer of antibiotic ointment on the front and back of the wound each time you wash the lobe. Gently remove any drainage from the wound with cotton balls. Most doctors will have you return for a follow-up visit 7 to 14 days after your surgery to remove your stitches. Massage the scar with cocoa butter 10 minutes each day starting a few weeks after the stitches have been removed. The coca butter will help soften the scar. In addition to the Z-plasty flap, there are several different types of repairs that can be done to repair your ear lobe. The degree of your tear will determine the type of procedure you will need. 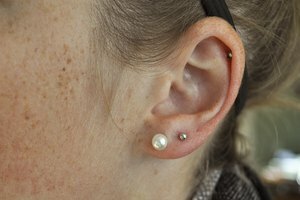 Most patients are able to wear small stud earrings after 6 weeks, and heavy earrings after 2 months. 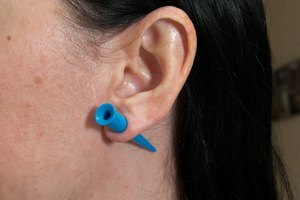 Wear only small stud earrings until the ear lobe is fully restored.